This is a fully automated Expert Advisor. This indicator is based on the SAR indicator with certain additions and filters. Automatically adjusts to any broker. The smaller the spread, the better. Does not use Martingale. Attempts to close the unprofitable deals at the expense of the profit of previous deals. In case there are other deals opened on the account, or if they are opened manually, it will automatically close them once profit is reached. Precision of quotes: Any (both 3/5-digit and 2/4-digit quotes). 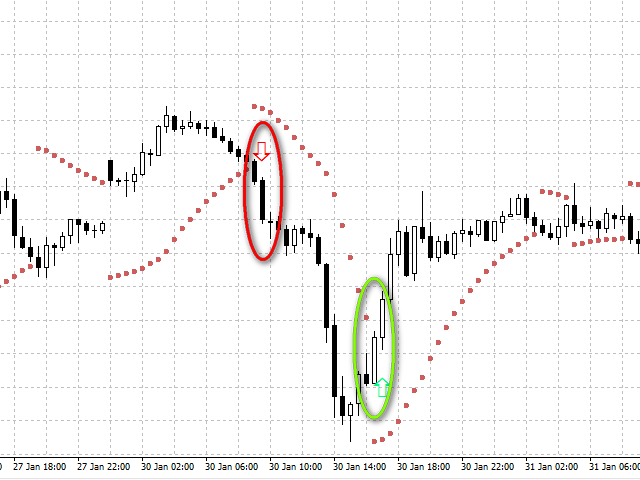 When using 2/4-digit quotes, the TrailSize and StopLoss values should be decreased by 10 times. LotSize - lot size (0 - automatic calculation of the lot size based on balance). TrailSize - Automatic trailing - Dynamic stop loss points. Used to get the maximum profit from each deal. StopLoss - Protection from losses during a drawdown, in points (if 0 - disabled). Chart timeframe: Any (does not affect operation of the EA). But in the strategy tester specify: period not greater than M15 (if useM15 = true). period not greater than M30 (if useM30 = true). Обновленный алгоритм и исправление ошибок.